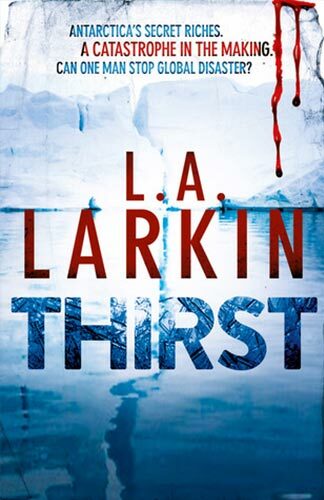 Book Synopsis: Thirst is L.A . Larkin’s second book, and like her first, The Genesis Flaw, it is a thriller written with an environmental theme. The time frame for this book is ‘a few years from now… ‘ and it is set in a world where water has become more important than oil. The story opens in Antarctica, where a maverick geologist, Luke Seale, is called upon to save the Antarctic ice from being stolen by a Chinese general, who, it turns out, is in competition on several fronts with his Western-educated son, who is a ruthless mercenary. It is a fast-moving, violent, bloody, futuristic novel that will appeal to many. There is no doubt Larkin has researched her subject well, even visiting Antarctica. Her acknowledgements read like a who’s who of the Australian Antarctic Division. Characters at many times seemed to be inhabiting a sort of James Bond type novel, set in the future and on ice. This reviewer, who considers she is fairly aware of climate change and the threat it poses to the planet, probably started reading with a slight bias in that direction, but very soon found it hard to suspend disbelief; particularly when the story leaps back and forth from China to Australia to Antarctica and connections between characters and past happenings occur with amazing coincidence. Nevertheless, even with this fragmentation, Thirst is a page-turner and Larkin paints a worrying picture of the future.